The eight novels of the Saga are almost impossible to classify. Yes, they are works of historical fiction -- but they are also love stories, mysteries, crime stories, allegories and regional novels. The seventh novel, called "Sacrifice", is best classed as a thriller, and the eighth, called "Conspiracy of Angels", might be called a "literary novel." They are enjoyed equally by male and female readers -- and all the readers are more than a little intrigued that author Brian John, a happily-married father and grandfather, should have "taken on" so enthusiastically (and successfully) the persona of a strong and passionate female in the telling of the tales. The full story of Martha Morgan's life came to Brian during a night of delirium on Gran Canaria in 1999, after he had picked up something nasty on the flight from London. (He now thinks he was affected by aerotoxic syndrome.....) The full narrative, complete with characters, places, twists and turns in the plots, and even detailed conversations came into his head and stayed there until it was all written down. He still feels, to this day, that the story was a gift, but he has no idea where it came from! The first novel, "On Angel Mountain", covers just one year of the heroine's life, when she is still a nervous teenager learning how to survive in a brutal world. The second, "House of Angels", deals with Martha's time as a young mother who discovers her own strengths and who sets a complex trap for the evil men who have designs on her and her estate. The third book, called "Dark Angel", is the most inward-looking of the novels, dealing with the themes of motherhood and female insecurity in the context of an ultimately tragic love affair. 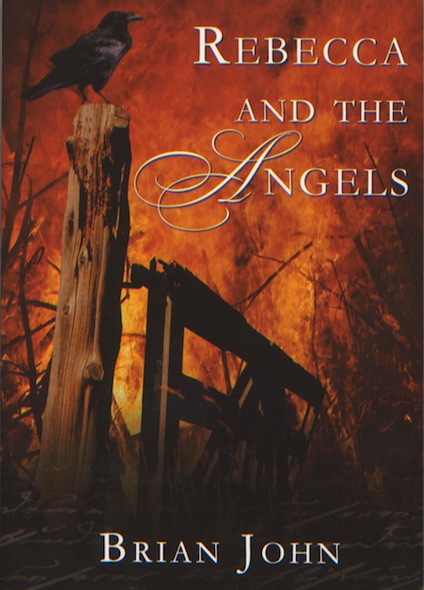 Book four, entitled "Rebecca and the Angels", describes how Martha tries, in her middle age, to do something to make the world a better place -- and in so doing lands herself in a series of very dangerous situations. And Book five, called "Flying with Angels", covers the last years of the heroine's life, during which she has one last romantic fling and has to deal with a number of very determined and shadowy enemies. Book six, called "Guardian Angel", deals with the few years following Martha's recorded death. The heroine is somebody who goes by the name of Susanna Ravenhill -- but who is she? And the seventh novel," Sacrifice", the only one which does not have the word "Angel" in its title, covers a period of about two years, and slots conveniently into a long gap in the story related in "Dark Angel." It is a very dark tale, with a number of traumatic episodes built into the narrative. "Conspiracy of Angels" is set in the year 1810, and the story immediately follows that of "Sacrifice"; it is an adventure story in which Mistress Martha become involved in the anti-slavery movement and in which she ends up dicing with death. 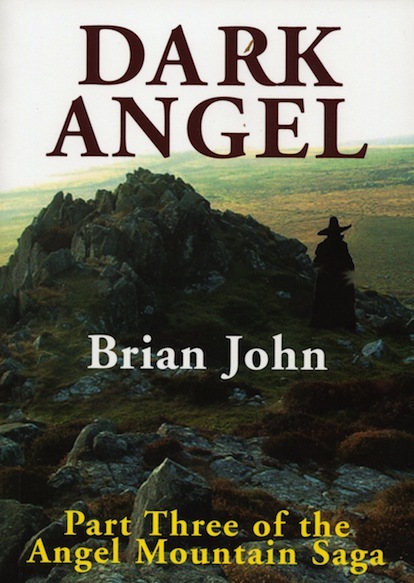 The eight novels of the Angel Mountain Saga now have accumulated sales around 100,000, with 36,000 copies of "On Angel Mountain" leading the field -- as one might expect. The first three titles were also published by Corgi, but Brian was very disappointed with the lacklustre marketing and publicity campaign for the titles, and he asked for the rights to be returned -- since when sales have steadily increased. We are gradually moving towards a "house style" for the novels, with a highly ornamented letter "A" wherever the word "Angel" occurs in a title, and with a hint of Martha's handwriting towards the base of the cover. "Sacrifice" did not have a convenient angel in the title, so an ornamented letter "S" had to be used instead. Another recurring theme on the covers is the raven -- which has great symbolic significance, as readers of the series will know. You can click on any of the above images if you want to read more about any particular title. ​Good news on the audiobook front. In response to requests from readers (or rather "listeners") I have been trying to clarify the position regarding the two audiobooks recorded by WF Howes / Clipper Audio a few years ago and issued on cassettes. Tape recordings have rather gone out of fashion, and hardly anybody uses them any more. The taped versions have been discontinued, and are no longer on the catalogue. But after discussions with the Contracts Dept of WF Howes they have decided that they want to re-issue both "On Angel Mountain" and "House of Angels" as digital audiobooks and in CD format. All being well, they will be available via libraries and through Audible and other outlets in the summer. Some editorial work needs to be done on the original recordings, but I now have the WAV files and they are of excellent quality. 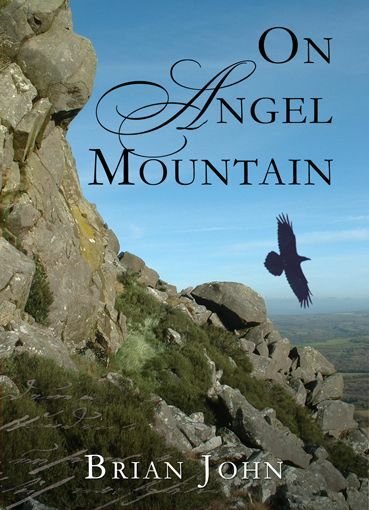 Another piece of good news is that the Calibre Library, which makes audiobooks available for blind and partially-sighted people, wants to make a new recording of "On Angel Mountain" specifically for its own use. I'm happy to go along with that, even though the deal will not earn me any income -- since I'm a firm believer in getting as much "audio" literature as possible into the places where it is most needed and where it makes the greatest contribution to quality of life.